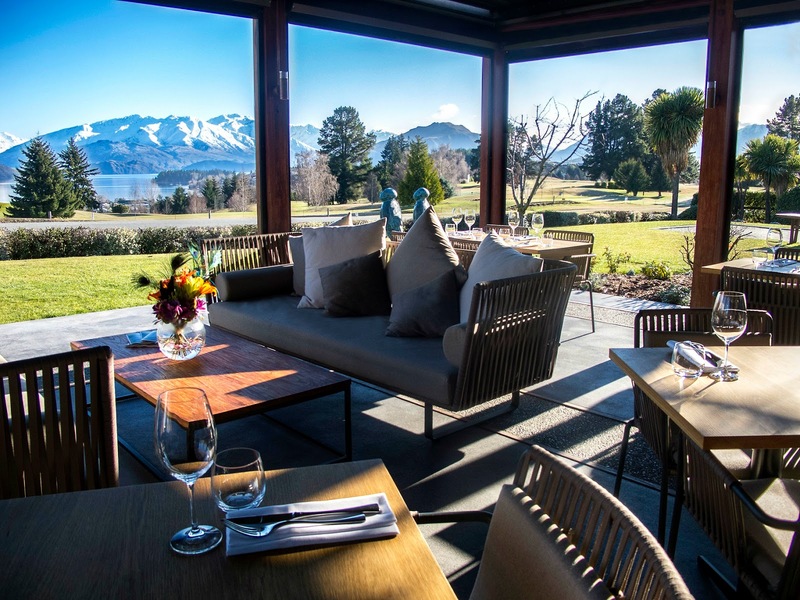 The ride from Franz Josef to Wanaka is most scenic and finally when I reach the town of Wanaka nestled lakeside, encircled by colossal mountain ranges and nature reserves, I fall in love with perhaps one of the most beautiful locales in New Zealand…. I drive into Wanaka right in time for lunch and my first stop is Bistro Gentil where in a magical setting surrounding a pretty courtyard, Chef Mario Rodrigues garners the regional produce and sublimates them through his imaginative and refined cuisine, bursting with flavours and respectful of the product. He conceives dishes with intelligence and intuition, subtlety and creative spirit and I get to savour the essential delights of the table. House made chicken liver pate is served with the most artistic flair without compromising on the taste, a most original dish beyond creative but still ‘organic’ as opposed to science experiments is a highlight for me. On offer are also Maude wines, from the nearby vineyard to reduce the environmental footprint of transporting this! Wanaka is one of the most scenic places I have encountered. The majestic craggy mountains and the beautiful lake form a magnificent backdrop to this beautiful town. Wanaka has so much to offer that it is almost surreal I love their outdoors and the fabulous food, but no holiday to Wanaka is complete without a picture of the world famous Wanaka willow tree! Wanaka is also the preliminary point to discover nearby Mt. Aspiring and the National Park. I am staying at the Edgewater Resort and pulling away myself from the scenic beauty of the lake from my balcony is bit difficult, but a walking tour with my Maori guide Joe takes me closer to the lake and the tree and the local culture. With Joe, I get to experience an up close and personal Hongi and Haka at the Wanaka Tree which ended with a unique Maori bone carving necklace as a souvenir of my experience. I love lavender in its original state as it brings a sense of peace and calm and looking at beautiful lavender fields is something I truly enjoy. For an entrance fee of just about a 100 INR, I get to wander over the 10 acres lavender field and gardens. I see the fruit trees, alpacas and sheep. Of course, a lavender farm is inevitable to retail its products. Out here, there is a wide variety of products to choose from, including oils, lotions and the works. My favourite part is enjoying a scoop of lavender chocolate ice cream in their quaint little café. I am in love with the natural ambience, peaceful and oh so charming. At 3030 metres high, Mount Aspiring is often called the ‘Matterhorn of the South’ I take a Southern Alps air flight over Lake Wanaka and Wanaka Township​ and am simply mesmerized by the views; Highlights include, Treble Cone ski field​, Matukituki Valley, Bonar and Voltar glaciers, Mount Aspiring​& the Southern Alps. I am back in town by the early evening to grab dinner and to get my fill of yet another sunset over the lake before heading for a movie at Ruby Cinema & Bar and calling it a day! Best Place to Stay: Stay in one of Edgewater's studios, suites or apartment accommodations on the shores of Lake Wanaka. Best Places to Dine: Bistro Gentil for a farm to table experience, Big Fig for slow food served fast & Francesca’s for super awesome Italian.